Today around 4:00 I started freakhoging! As another mother said in a comment, not getting any messages back from the hem/onc department causes undue stress. But when it creeps close to quitting time the anxiety levels rise exponentially. Even though I realize that when doctors pay the 100+ grand for their MD, not to mention the blood, sweat and late nights, that they realize that being “on call” will be part of their future, I hate to bother them. Maybe it is a deep seated worthiness issue, or maybe I’ve seen one too many doctors or surgeons standing out front of our restaurant taking calls instead of sitting with their families or guests. It is a service that I use sparingly. On my last attempt to reach someone at 4:30, the phone system had turned itself off and gave the….”I’m sorry we’re closed, if you have any problems please dial. 234982749873 and ask for the pediatric hematologist/oncologist on call.” After I hung up, I said, by george Ima gonna call ’em. And when I did the operator told me the clinic was still open, but she paged anyway. After I’d apologized profusely for bothering the man I launched into my tale. Of course it wasn’t any doctor we’d seen before and he’d no idea about our case, so we had to go into details. Some of which I couldn’t remember. Odd, since I used to remember all kinds of details. “Doc,” I said, “My daughters ANC is 352, I need to know what to do with her medicines.” Okay, I didn’t say that, basically I said, Doctor I am freakhoging that I can’t reach anyone and it is quitting time, and from the calculations on the blood work that I got today in my hometown, not at the clinic, it says that her anc is 352… and then he double checked my math and sure enough… I was right. Imagine that.. Yes, I did just say 352. 352 people. Her platelets are 83k. Hgb in almost normal range, but where did all her WBC go? Obviously they were devoured by the spleen!! From what I hear a spleen’s palate can be quite fickle. Seriously, I have no idea what is going on. Yesterday when I did NOT hear anything I made the decision to hold her medicine. Does that sound like me playing doctor…. maybe a little bit, but I can always blame my husband. When we started this journey in January 2009, I gave him 51%. That means that even though I can discuss a point, he gets the final vote. That way if any difficult decisions had to be made, or if I disagreed he would take the responsibility for making it. It has worked. I’d highly recommend this percentage based system. So, no meds for her last night. (Actually not on Sunday either.) Her belly was huge, I could palpate her spleen…. does that sound like an excuse? Okay, the doc agreed hold her meds until next week. Let her recover, and I fessed up about last night and he seemed nonplussed. I did say that if we were in the middle of Delayed Intensive 2 I would not have made that decision but a month away from being off treatment,in this stage the game, 352 is too low. The only way to counteract that is to remove the medicine for short period of time. We’ll be back on schedule on Monday when we go in for her visit. VCR and DEX and then resume the MTX and 6-MP> (This last bit for those that need deets on the meds. Besides being angry at not being contacted, I feel that we made the right choices and that she will recover from this bout of splenomegaly and from the ridiculously low ANC. BUT >>> though it means that we won’t be leaving the house much and will miss ballet class for the second time in two weeks. Isa and GG at ballet their second week after starting class in January. You can see Isa’s big belly. This was taken 10 days after her bone marrow biopsy to check for recurrence of disease. Her spleen was quite enlarged but also she’d taken a course of steroids which makes her belly distended. omg chubi! your grrrls are mini chubis. so cute cute cute. you’re a good doc/mom/chubi. love you. new mexico is blowing away. Almost forgot – freakhog is my new favorite word. i think i may have to highlight this comment somehow…. make it sticky or something…. I just used freakhog in an email conversation. Am loving it. So glad the” witty repartee” is back! It’s been a long time coming. Since you have obviously been giving the on call docs a bit of a break for the last two years, you should feel free to cash in now! My husband is a resident (his last year- finally), and yes, it just comes with the job. And he never minds when he gets paged for a question- it almost makes him happy because whenever the pager goes off, he pretty much plans to go in. So, questions and call backs are the easy part. One night, we needed to set up some labs because M’s blood sugar was super low and we were leaving on a trip the next day. He called her fellow at home when he wasn’t even on call. I felt terrible, but my husband didn’t mind at all =). 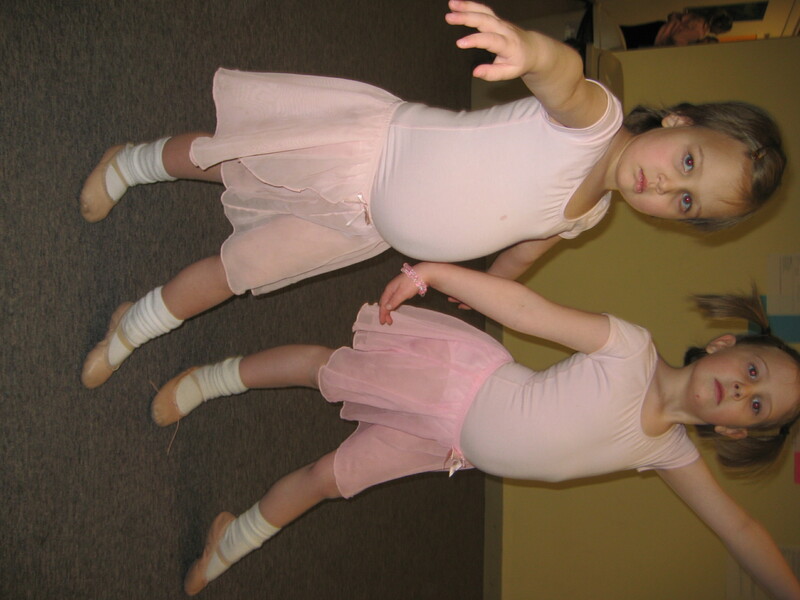 Thanks for cute pic of your ballerinas. lol… good to hear it from another perspective…. I’m not a doctor but I play one all the time. Good move on holding the meds, even better job on holding money responsible. Quinn was on 50 percent dosage the entire ltm. It still seemed like the reduced dose was too much. Any idea on what is causing the drop in Anc? Do you think that the cumulative effects of all the Chemotherapy are catching up? I am impressed that you have Jedi control over your anxiety and didn’t frantically call until the second day. Wish the force was as strong with me. Instead I just become a frantic crazy, b*tch. When does Isa’s port come out? One more month to go……… What will we do with the time usually spent making potions of chemotherapy? I’m thinking of taking up drinking wine and watching tv. How about you? as far as reduced anc, my guess is viral infection… wait, that is supposed to raise it. seriously, the spleen is housekeeping. the meds gotta make the cells wonky and the spleen is sort of a perfectionist… i hope. Okay, now I feel stoo-pid (see, even when you’re having a crisis with your child it’s all about me.) I didn’t notice your last post was written yesterday, so now you obviously knew what the labs said. I’ve been failing reading comprehension 101 over and over again recently. You definitely did the right thing by holding her meds. Our head NP told me (in LTM) that when in doubt, hold the meds until I spoke to someone re counts, etc. Especially when it comes to giving the weekly mtx. Isa’s body is just hating this chemo recently, isn’t it? Less than a month to go…. Love love that you had someone tell you that. It makes me feel completely vindicated and justified and any other word that basically means that. …. Yes, well, I haven’t been posting then all of sudden I have access to internet again, and my witty repartee is back! Just a little over a month, and we’ll be off treatment. and like you know that doesn’t mean that everything becomes perfect. In fact I think it means our grocery bill will increase two fold. She’s already hungrier than she’s been in two years!!! And I love that you have the state of mind to realize that of course it is about you!! !